By Dr. Daniel Kamen, D.C. Currently out of print and out of stock. Available only on Amazon Kindle. 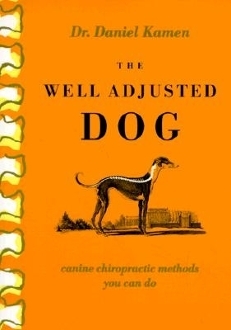 The Well Adjusted Dog is a 'How-To' book, detailing how to perform 20 canine chiropractic moves. These are the same techniques used by professional animal chiropractors. Includes anatomy and case histories. Best seller. Personally autographed by the author. Dr. Kamen, a practicing chiropractor since 1981, completed the American Veterinary Chiropractic Association's certification course in 1993. Dr. Kamen has conducted over 400 hands-on animal chiropractic seminar here and abroad.